April 13 and 27 are designated trash pick-up days for the annual Don’t Pass It Up, Pick It Up litter clean-up campaign at Rocky Fork State Park. This photo was taken Tuesday between the Highland County Airport and the park’s main entrance on North Shore Drive. In what Lori Morris of the Rocky Fork Lake Community Alliance called the kick off event for everything that is done throughout the year, the annual “Don’t Pass It Up, Pick It Up” litter cleanup campaign is coming up on a pair of Saturdays in the month of April. The annual litter cleanup program at Rocky Fork Lake has been going on for 12-plus years, according to Paint Township Trustee Randy Mustard, and coincides with the observance of Earth Day on Monday, April 22. He said anyone can volunteer with the cleanup effort, emphasizing that a person doesn’t have to be a resident of the Rocky Fork Lake area or even Highland County, but simply needs to show up with a mind to work on those particular Saturdays. The faces of the volunteers range from the Highland County Probation Department’s community service workers to Boy Scouts working on merit badges to high school seniors satisfying community involvement requirements for graduation. Morris said that a few years ago a judge sentenced a young woman to pick up trash at Rocky Fork Lake and it surprised her at the amount of trash that littered the park and up and down North Shore Drive. “We also have some local residents who have adopted sections of roadway and they go out on a weekly basis picking up trash,” Morris said. 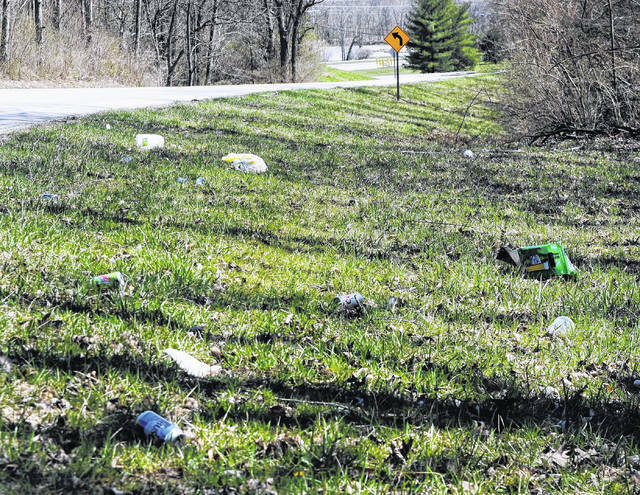 Like most state parks across the nation, the litter problem at Rocky Fork Lake has gotten worse over the years, with Mustard saying he would take his crew northbound on North Shore Drive with the intention of doing the southbound side the following weekend. He said in recent years they have pulled used propane tanks and tires out of the water, in addition to every kind of trash imaginable such as plastic and glass bottles, household trash, aluminum cans and even syringes. Potential volunteers can call 937-402-0075 can or email Angie Mustard at amustard8@gmail.com for information and to register. Morris advised all volunteers to bring a sack lunch and snacks, and plan on picking up trash at their own pace.